Cookin' with Smoke - The REAL Way to BBQ! Unless you're from the South, you probably haven't experienced real Southern style, rubbed, slathered and slow-cooked BBQ. Each meat is carefully trimmed to its leanest and then slow-cooked over wood resulting in very tender meat with a smoked flavour. All our recipes are made with the same dedication and care used in recipes and techniques handed down from generation to generation. Experience this "Honest to Goodness BBQ" with Smokin' Okies BBQ! Dine In, Take Out, Catering! Check here for current specials! 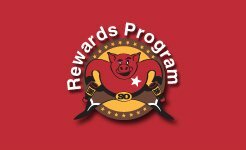 Join our Rewards Program and enjoy great savings!